Sturlyn C. "Mick" King, born Sept. 6, 1911, Austin, AR, and enlisted in the USN Sept.3, 1930. After boot camp in Hampton Rhodes, VA, he served in China for three years in the USS Bulmer and later on the USS Peary. He was an accomplished athlete, holding the title of lightweight Asiatic Wrestling Champion while on tour in China. After several other ships, he was assigned to the USS West Virginia on Sept. 6, 1941. On Dec. 7, 1941, the West Virginia was bombed and he was one of a handful of men that survived (they were on duty in the engine room). He has no recollection of how he got to the hospital and it was several weeks later before his family knew he was alive and safe. 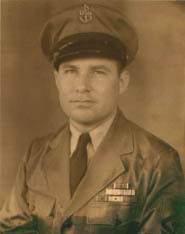 After leaving the hospital, he taught Diesel School at Hampton Rhodes and served on several other ships in the Pacific. After retiring in 1950, he was called up to teach Diesel School at Camp Elliot in San Diego during the Korean War. He ended his working career in Civil Service for another 18 years. He and wife Freda celebrated 62 years of marriage this year. They have three chilren, seven grandchildren and four great-grandchildren. Sturlyn C. King passed away on March 15, 1998.